Can Your Baby Do This? Look who is 6 months old already! Grayson is a super great baby. Always happy with cute little squeals and giggles. He is starting to get the hang of sitting up, sleeps about 10-12 hours at night, and he holds his own bottle now too. Plus, he FINALLY rolled over for the first time on Saturday. It was very exciting. He is really content and is usually perfectly happy just laying around with a few toys near by. 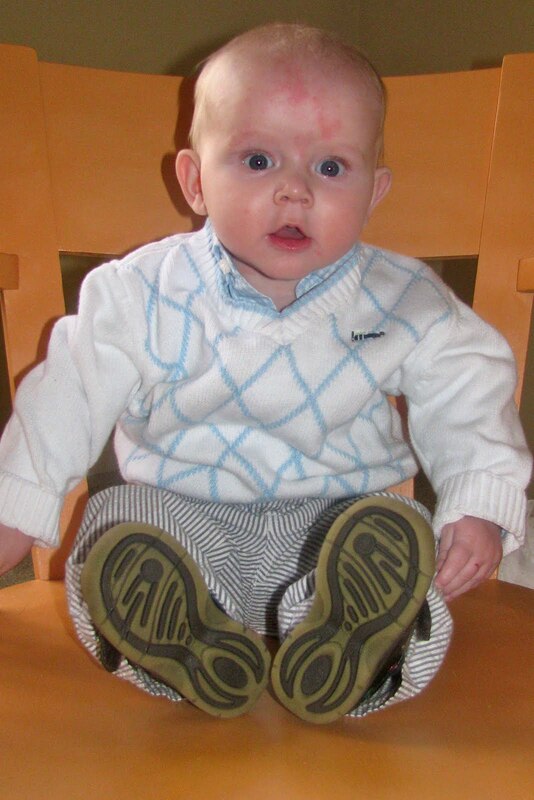 He went for his 6 months appointment today. He weighs 17 lbs 10 oz and is 26 3/4 inches tall. He is in the 50% range for both, he is just a little bit smaller then Aiden was at this age. Adam and I are not big fans of Valentine's Day so we always spend the evening with the boys. Over the weekend I got to "help" Xavier do his Valentine box. I'm a firm believer in needing a theme for the box so we went with bugs. He then decided that he wanted to include his airplane that he painted about a year ago. So I came up with a plan and we went to work one afternoon. 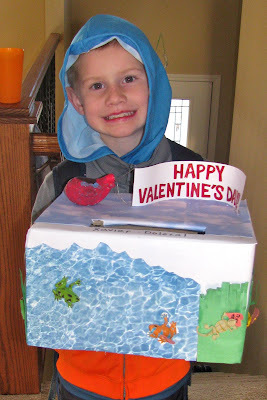 I decided bugs, lizards, frogs and snakes do not scream "Happy Valentine's Day." So I added little hearts to them so it looks like they are exchanging Valentines too. Xavier said it was the hit of his class. For their gifts this year I made Damon and Xavier blankets that go along with their bedding and Aiden and Grayson got animal finger puppets. We also got them new shirts. And Damon, Xavier and Aiden got these shirts I found online. They have animals on the front and when they cross their arms it looks like their mouth is opening. Damon got a dragon, Xavier's is a killer whale and Aiden's is a dinosaur. I tried to make a nice dinner that night and we had heart brownies that I decorated with m&ms for dessert. Although the Super Bowl didn't quite turn out the way we had hoped (turns out your team can't win when they play like crap the whole game.) I still wanted to post our family pictures from Sunday...because let's just admit it...my family is awesome! 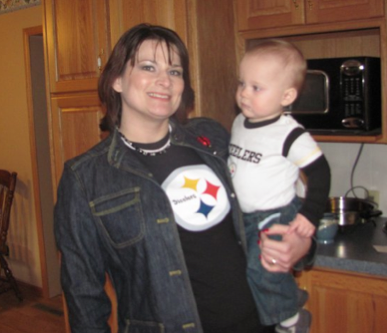 Here's our crew in our Steelers gear. I made the boys ties so they could support their favorite team too. 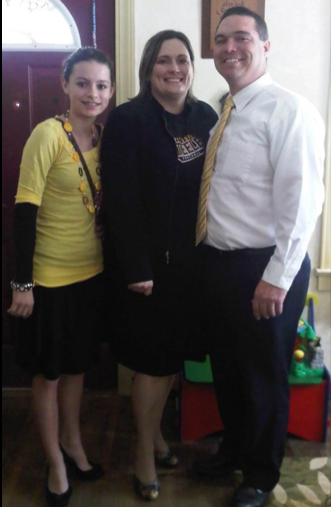 My sister Carrie and her family ready for church, also wearing their black and gold. And my sister Charla and her son Jax with their Sunday attire. I love us! I'm thinking its family picture time! Sometimes in Primary you get these warm, heartfelt answers where you know that the children have been taught by the Spirit. Other times you get funny answers that just make you laugh. Today was one of those days. "What must we do to return to Heavenly Father?" "Die!" "What do we need to do to get married?" "Have a body"
"Where do we go to be with Heavenly Father?" "Satan?" "Who gives you the gift of the Holy Ghost?" "SANTA!" The kids were listing all the things Heavenly Father commanded us to do. 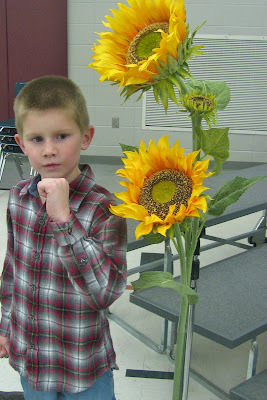 One kid said, "Multiply and replenish the earth." And a boy then said, "I don't know how to do that." I think the Super Bowl had some of the kids in a mood, they were a little hyper today. He can't roll over, he doesn't have teeth, and his sitting up still needs a little bit of work, but he can do this! 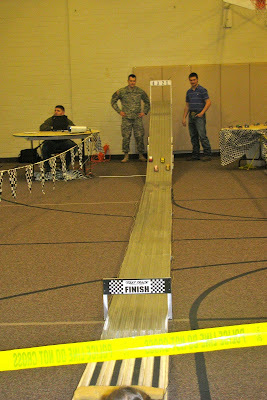 Last week was Damon's pinewood derby event. 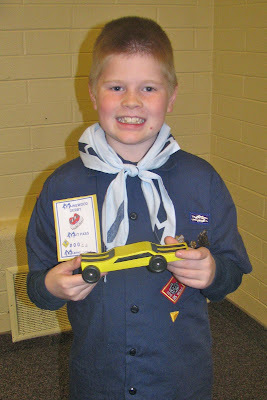 He was pretty excited about it but unfortunately his car didn't do so well. 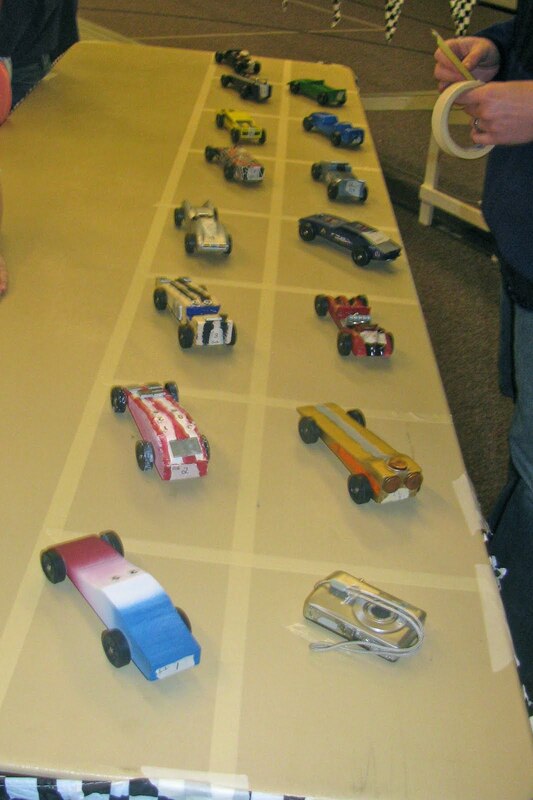 We are always grateful that it is never the last car, but he really had high hopes this year that quickly came crashing down. But he handled it really well and Adam treated him to a soda after which perked the little guys spirits right up. Not so happy at the end. He did get "the car most likely to drive Ben Roethlisberger to the Super Bowl" award. That made him happy. 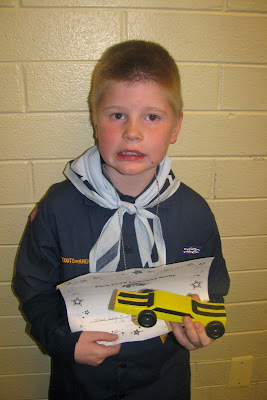 Xavier had his school program last week, it was on KS. I've included some videos, he swears he knows the songs but it doesn't look like it from the videos. For being so loud, he doesn't sing very loud. His teacher did say she was looking for the kid who smiled the most during the program and Xavier was the one!